Action Pathways offers a comprehensive approach to meeting the unique needs of each individual client. The Client Services division is focused on a holistic approach to supporting clients achieve employment, education, and financial success. We do this through 2 distinct programmatic functions—Consumer Credit Counseling Services (CCCS) and ASPIRE Self-Sufficiency (CSBG). Consumer Credit Counseling Service of Fayetteville (CCCS) is a non-profit service. We are certified by the Department of Housing and Urban Development (HUD) to provide comprehensive Housing Counseling services a and have provided quality services to our community for over 30 years. As a Neighborhood Financial Care Center, a variety of services are offered to help our clients achieve their financial goal. Services include education in the wise use of credit and assistance with resolving debt problems through counseling. If you are behind in your mortgage payment or think that you will become delinquent on your mortgage, talking with your lender may be the last thing you want to do. Most borrowers facing foreclosure are frightened and feel less intimidated talking with a housing counselor. Our certified counselors can help you address the underlying issues that are keeping you from making your payment on time. Moreover, they can facilitate communication between you and your lender. More importantly, your counselor can help you understand your options and offer long-term solutions. Forbearance-The lender might postpone legal action and work out a repayment plan that is affordable for you. Repayment Plan-The lender will allow you to pay extra each month until you are caught up. Note Modification-If you have an adjustable loan, the lender might freeze the interest rate before it increases, drop the interest rate, or extend the amortization period. Refinance-If you have sufficient equity, the lender could add the back payments to your loan balance. Partial Claim-There is certain government loans which contain provisions that allow you, if you meet specific criteria, to apply for another loan, paying back the missed payments. Reinstatement-Within a limited timeframe, you are able to bring mortgage payments current, pay attorney fees and stop foreclosure. Pre-Foreclosure Redeem or Short Sale. A short sale will negatively affect your credit, but not to the extent as a foreclosure would. Best used when home is worth less than what you owe. Deed-in-lieu of foreclosure- You could deed the property back to the lender, and the lender could forgive the mortgage. This option affects your credit the same as a foreclosure would. Call us today at (910) 323-3192 to set up your appointment! We can gladly offer any of our workshops at your next event or customize one to meet your unique needs! Contact us today at (910) 323-3192 for more information. Whether you are struggling financially or simply need a little extra guidance and advice, let our qualified team of financial counselors help you develop a clear path to your financial future. Whether you need help reviewing your credit report, understanding savings and banking, or navigating investments, CCCS of Fayetteville is here for you. We are committed to a culture of service to our clients, treating each person with the dignity and respect you deserve. Are you unable to pay your mortgage due to some hardship or need help budgeting for your next big purchase? Please fill out a Financial Counseling request form and email it to [email protected] or call (910) 323-3192 to schedule an appointment with our certified financial and housing counselors. ASPIRE stands for Achievement, Success, Progress, Independence, Readiness and Evolve, all words that exemplify ASPIRE’s principles and beliefs. ASPIRE is a comprehensive program that assists individuals and families attain the skills and knowledge that are needed in order to rise above poverty. Our goal is to assist individuals and families attain the skills and knowledge needed to rise above poverty, no matter what stage of life they are at, by giving them the guidance they require through mentorships, trainings and support. Are you in crisis mode? Are you finding that you aren’t able to make ends meet or that you or your family are going without food? Do you know that it is time to make a change in your life but don’t know how to make that change? If yes, then ASPIRE is the program for you. Do you have a job but aren’t really satisfied? Are you looking to make a personal change and don’t know where to begin? If so, then ASPIRE is the program for you. ASPIRE’s mission is to promote strong work ethics, economic literacy, and positive family values throughout Cumberland and Sampson County. Who qualifies for the ASPIRE program? Since funding is limited, individuals are selected to participate in the program based on whether you are a resident of Cumberland or Sampson County; income must be at or below federal poverty guidelines; must be willing to comply with program guidelines; must be willing to seek and obtain employment; and must be ready and motivated to accomplish goals geared toward obtaining employment. 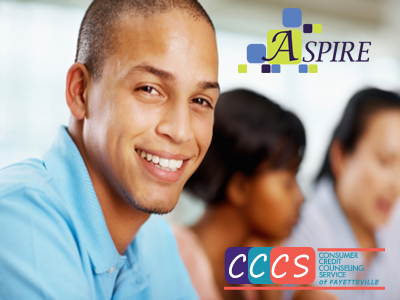 The ASPIRE program will help you gain the skills and knowledge to obtain proper employment. Workshops and seminars will be given on resume building, goal setting and personal achievement, decision making, anger management and financial literacy. Workshops are based on the needs of the participants. What can I expect once I enroll? You can expect us to provide reasonable and appropriate supportive services to enable the family to attain skills, knowledge and motivation to secure the opportunities needed to rise above the Department of Health and Human Services Poverty Income Guidelines for its household size, to assist at least one family member in obtaining employment through counseling and referrals to existing job readiness and job placement programs and to assist participant’s in acquiring needed resources. To attend ASPIRE Workshops or ASPIRE seminars and complete the following activities: Resume and Cover letter, Family Budget, Work History and Education History, and any other assessments that may be relevant and appropriate to participant’s situation. To complete an Action Plan that is representative of the Participant’s goals and activities to reach those goals. The Participant also agrees to follow-through on the activities contained in that Action Plan. To abide by this Agreement of the Program and to ensure participation and cooperation of all family members that are in the program. That the family will at to rise above the poverty level by utilizing resources designed to assist them in solving their problems as agreed to between program staff and the participant and reflected in the Action Plan. To fully cooperate with program staff and agree to follow-up contacts on a bi-weekly basis during agreement period. When the participant misses a session, the ASPIRE program staff will send a “No Show” letter. After two (2) consecutive misses the participant may be discharged from the program. To begin Employment and/or Education/Vocational Activities within three (3) months or be discharged from the program. To provide grades, certificates and degrees as a result of participation in educational/vocational activities. Anyone interested in participating must first fill out an application and attend a mandatory orientation in order to be considered. For more information please call (910) 223-0116, option 1. Are you a business looking to hire motivated individuals who are looking to make a change? If so, ASPIRE would love to partner with you. The Employment Pilot Program is Cumberland Community Action Program, Inc.’s response to the need to create new jobs and get members of the community employed. The program offers subsidized employment and job training for our ASPIRE program participants in public, private, and non-profit sectors of the workforce. The Employment Pilot Program will contribute to the creation and retention of jobs for Cumberland County residents, and through wages earned and spent, program participants will contribute to the county’s economy. What do I get out of partnering with ASPIRE? By partnering up with the ASPIRE program you are taking the first step in helping members of your community obtain employment. Financial companies choose how they share your personal information. Federal law gives consumers the right to limit some but not all sharing. Federal law also requires us to tell you how we collect, share, and protect your personal information. Please read this notice carefully to understand what we do in compliance with Gramm-Leach-Bliley Act. Non-public information is collected for the purpose of providing you with the best service possible. Information is never shared with third parties without your consent; and is only done so acting on your behalf. We never share personal or identifying information for marketing purposes or purposes other than client education and debt management services. All financial companies need to share customers' personal information to run their everyday business. For example, clients enrolled in our debt management program will need to allow CCCS counselors and staff to communicate with debtors on their behalf. Personal information may be exchanged to facilitate normal business. We will maintain your personal information for a period of 3 years after you are no longer our customer. To protect your personal information from unauthorized access and use, we use security measures that comply with federal law. Files and information are protected in secure storage and/or encrypted data centers. In the event of a security breach, CCCS will notify you immediately for your own protection. For more information about the Gramm-Leach-Bliley Act, please visit ftc.gov.